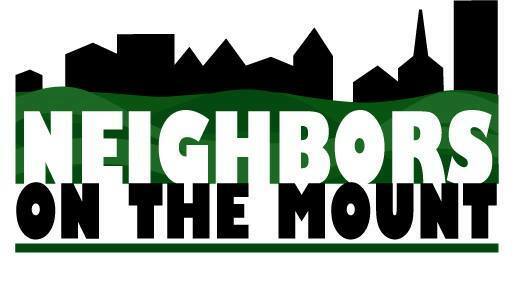 Neighbors on the Mount is a volunteer action group to help improve quality of life, public safety and community connections in Mount Washington and Duquesne Heights. Summer is winding down, and The Neighbors on the Mount are looking forward to the Fall. The summer was busy with some great events and partnerships. The Neighbors on the Mount partnered with the Mount Washington Community Development Corporation to host a happy hour event at Coughlin’s Law Kitchen & Ale House on June 21st. Neighbors could mingle and enjoy the first day of summer at the newest restaurant and bar on the Mount. Several clean-up events were sponsored by the Neighbor on the Mount this summer. The Well Church partnered with the Neighbors on the Mount for some of the clean-up projects. On July 28th, the Neighbors on the Mount sponsored a clean-up and weeding of the Firemen’s Park. About 20 people helped out with that project. At the end of the summer, the Neighbors on the Mount hosted a table at the Community Picnic at Olympia Park that was sponsored by the Grandview Lions Club and Council-woman Theresa Kail-Smith. The library hosted a craft table and more than 300 buttons were made during the picnic. On September 22nd, the MWCDC hosted their 2nd Annual Block Party on Grandview Avenue. This great neighborhood party ushered in the Fall season in style with lots of great food, drinks and entertainment. We would like to thank everyone that stopped by the Neighbors on the Mount tent during the block party. Join us to talk about Public Safety, Neighborhood Beautification Projects and Community Events. Councilwoman Theresa Kail-Smith will be on hand to share some neighborhood news. The meeting will be held at the Grandview Bakery. Join your neighbors with cleaning up the Mount! Meet at the Shiloh Street Garage to pick up gloves and bags. A meet-up after the clean-up is planned at Coughlin’s Law Kitchen and Ale House. More October Events to come soon. Stay tuned for more information. ICYMI: On Thursday June 21st, the Neighbors on the Mount (NOTM) partnered with the Mt. Washington Community Development Corporation (MWCDC) to host a community happy hour that celebrated the Summer Solstice at Coughlin’s Law Kitchen and Ale House. As part of the celebration, a Pittsburgh and Neighborhood Trivia contest was held and these were the questions. Test your knowledge of Pittsburgh Trivia! The answers will be shared at the bottom. 1. In what year did Pittsburgh first claim the top spot in the Places Rated Almanac and was declared America’s Most Livable City? 2. What is the oldest building, of any kind, that is still standing in Allegheny County? 3. Who bid adieu to the viewers of his 11 PM newscast with “good night, good luck, and good news tomorrow”? 4. Before Channel 11 became WPXI, what where its call letters? 5. What was Fort Pitt Beer’s slogan? 6. This community within the larger Mt. Washington neighborhood of the city of Pittsburgh was designed on the principles of the Garden City Movement of the early 20th Century. It was declared a National Historic Landmark in 2005. 7. The first Pittsburgh incline, built in 1870, was the ____________ Incline. 8. The Duquesne and Monongahela Inclines, are the oldest continuous inclines in the world. Another word for this type of incline is what? 9. The Wabash tunnels were remodeled in the 1960s for what unrealized light-rail system? 10. What majestic Mt. Washington landmark was dedicated on December 19, 1897? 11. This park space was once known as the Grand View Scenic Byway and includes all of the area parks and greenspaces in our neighborhood. This 257-acre green space includes 10+ miles of trails. 12. By what name was Mt. Washington known as previous to 1876? 13. What neighborhood institution’s address is 315 Grandview Avenue? 14. This member of the royal family visited Mt. Washington on a foggy, rainy day in 1988? Who was it? 15. Who the was Mayor of Pittsburgh when Engine Company 27 was erected? 16. What organization was formed in 1964 that saved the Duquesne Incline? 17. Johnny Unitas was a Hall of Fame quarterback that grew up in Mt. Washington. What high school did he attend? 18. These tunnels are the longest automobile tunnels in the City of Pittsburgh. 19. Bill Clinton and this Prime Minister of Great Britain visited Mt. Washington on Feb. 28, 1994. They rode the Duquesne Incline and dined at the Tin Angel. Who was the prime minster? 20. Point of View is a 2006 landmark public sculpture in bronze by James A. West; it sits in a parklet named for the work of art. The statue sits on the corner of Grandview Avenue and Sweetbriar Street in Duquesne Heights. Who is depicted in this face-to-face meeting?